Any thoughts of a post-Christmas sleigh ride for the supermaxi yachts contesting the Rolex Sydney Hobart race are decreasing as the Boxing Day start time approaches. A preliminary weather prognosis from acclaimed yachting meteorologist, Roger Badham, indicates that while the fleet of 109 will initially make a fast run south from Sydney, their progress will be slowed dramatically when a cold and powerful southerly change confronts them within hours of the start. It is then likely that the winds will be “on the nose” – from the south – well into the next day. Badham’s current forecast predicts that a strong southerly change averaging around 30 knots will hit the fleet during the afternoon on Boxing Day and persist – though getting lighter – through until the big boats exit Bass Strait the following day. There is also a possibility conditions will be influenced by a tropical cyclone which is expected to form over Gulf of Carpentaria waters on Dec 23. The forecast pleases Wild Oats XI’s skipper, Mark Richards. The 30-metre long Wild Oats XI, owned by Bob and Sandy Oatley, has just been relaunched following dramatic modifications where the 30-metre long hull was virtually cut in half and a new, 14-metre long, forward section added. Wild Oats XI, which is recognised as the most successful yacht in the 71-year history of the Rolex Sydney Hobart Race, will have her final pre-race trial off Sydney tomorrow. She is due to be lifted from the water on Tuesday for a final rub-down, polish and equipment check in preparation for the 628 nautical mile classic, which starts at 1pm on Sydney Harbour on Boxing Day. While Wild Oats XI remains one of the favourites for line honours her chances of taking the double of line and handicap honours for a record third time seem remote. Badham’s current weather prognosis suggests that conditions will favour the smaller yachts in the race to be first on handicap. Richards’ final comment was: “It looks like a typical Hobart race”. 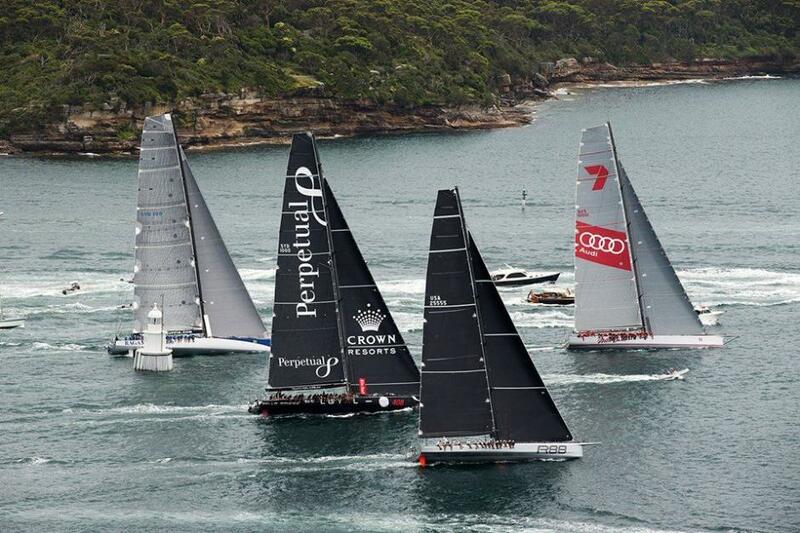 WILD OATS XI DOMINATES SOLAS BIG BOAT CHALLENGE – THE HOBART RACE CURTAIN-RAISER. Overcast skies and a modest breeze robbed the Cruising Yacht Club of Australia’s annual Solas Big Boat Challenge bash around Sydney Harbour of some of its drama this year, but the flat waters and light winds were made to order for the slim, elegant Wild Oats XI. After a perfect start, Bob and Sandy Oatley’s super maxi steadily drew away from the bigger, wider, more powerful 100 footers, Ragamuffin 100 and Perpetual Loyal, on every leg of the 14 nautical mile course. Only the much lauded American 88 foot speedster, Rambler, looked a potential threat to Wild Oats XI’s dominance of the annual Challenge (she can count eight wins from 10 starts, beaten only by her virtual sister ship Alfa Romeo). Barely a boat-length separated Wild Oats XI and George David's Rambler at the first windward mark. But as soon as the Australians unfurled their huge Code Zero for the downwind run to Fort Denison, it was as though she had found an extra gear. 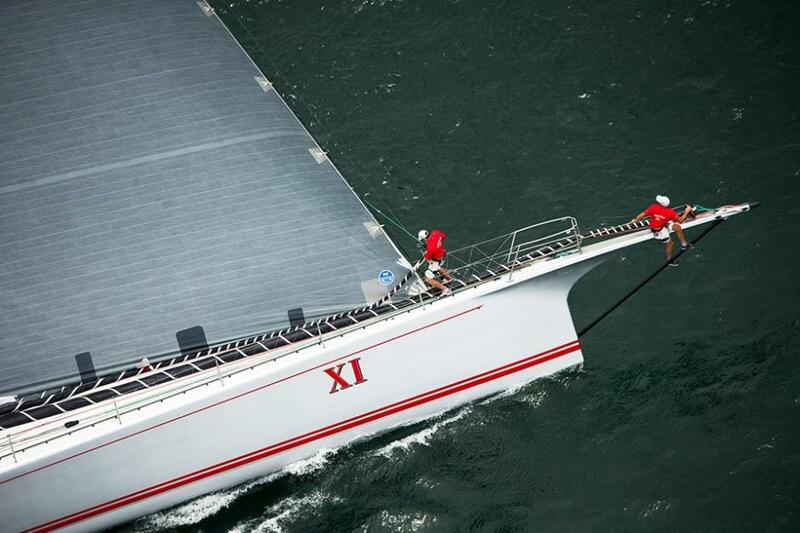 One boat-length quickly became 2, then 3, then 4 as Wild Oats XI settled into the race. In the end, 3 minutes 50 seconds separated the two boats when they crossed the finish line off the Opera House. Oats’ skipper Mark Richards was very pleased with this first outing of his radically rebuilt maxi. Looking at her, she is still Wild Oats XI, but she’s not. The longer bow has given her a more self-contained look, shifting the whole rig aft. is faster, but curiously she looks to be in less of a rush. It was a courageous, expensive bid to breathe fresh life into the 10 year old legend, but Richards is confident it has been money well spent. “We’re seeing improvements across the board with this boat. It’s a big deal to ask your owner to cut 14 metres off the bow of the yacht and two metres off the back, but they backed us and today showed the results,” Richards said. But this is round one, a curtain raiser. In fresher offshore conditions in recent days Rambler has looked very fast. And then there is Comanche, absent from the field today as she waits for her crew to fly in from America, a year older and wiser after her narrow loss to Wild Oats XI last year. PS: Comanche did not start. Teams from 28 nations are gathering at the Cruising Yacht Club of Australia and the Race Village in the lead up to 71st edition of the iconic Rolex Sydney to Hobart Yacht Race. The Cruising Yacht Club of Australia, founded in 1944, is the organiser of the Rolex Sydney Hobart Yacht Race with the co-operation of Royal Yacht Club of Tasmania. The race will start on Boxing Day at 1300 local time. There are a few boats and crews and individuals from Pittwater participating in this year's race, among them Palm Beach gentleman Michael Moleworth aboard Da Nang – Viet Nam, one of 70-foot ocean racing yachts in the Global Clipper Race Fleet that began arriving in Sydney last Sunday (December 13th, 2015). Da Nang – Viet Nam has the race’s first female Australian Skipper at the helm: Wendy Tuck (58), a veteran of eight Sydney-Hobarts who is looking forward to sailing into her home port. The tenth edition of the unique biennial Clipper Round the World Yacht Race left London at the end of August and has already raced over 16,000 miles after completing four of its 14-race global series of more than 40,000 nautical miles, making it the world’s longest, and toughest, ocean race. The Australia Leg consists of three races; the first started in Albany, WA to Sydney, NSW on 1 December following races from London, Rio de Janeiro and Cape Town. The second will be the famous blue water classic RSHYR on Boxing Day 26 December. Third and finally on 2 January the fleet heads to Airlie Beach, gateway to the picturesque Whitsundays. The teams will have to cross the infamous Bass Strait a total of three times. After Australia the race heads for Da Nang - Vietnam, Qingdao - China, Seattle, Panama, New York and back to Europe, finishing in London on 30 July 2016. The Clipper Race named Unicef as its official charity and gifted a branded yacht to mark the event’s tenth edition to promote the organisation’s global work with children, particularly across the multiple humanitarian emergencies that have put children in danger throughout 2015. Alongside the branded yacht crew all twelve teams have chosen to raise funds for Unicef’s work to build a safer world for children. To date crew members have raised more than $280,000 AUD for children’s health, education and protection programs against a target in excess of $600,000 AUD. Royal Motor Yacht Club Members Steve Capell (Skipper), Doug Otto (Sponsor) and crew (consisting of RMYC Members) will be sailing in this year’s Sydney to Hobart race on Boxing Day. They will be sailing on one of the world’s great ocean racer classics, the S&S Swan 65, built by Nautor's Swan in Finland. The yacht, normally called "Eve" is racing as "UGG Australia" in the Hobart race. Swan 65's have an impressive pedigree. Swan 65 Hull #1 of 40 was built in 1972 for the first ever Whitbread Round the World Race (now called the Volvo Ocean Race). A Swan 65 "Sayula 2" won the race. As a testament to the strength of these yachts, Sayula 2 capsized in huge waves in the Indian Ocean but popped up and carried on to win the race with no damage. All of the 40 Swan 65s built are still in service and none have been dismasted despite hundreds of circumnavigations. The RMYC boat is hull #35 of 40 and was built in 1982. The ‘’UGG’’ Australia crew have over 100 Hobart races between them and if the weather is right for the boat, they have a chance of a handicap win. Keep your fingers crossed for Steve, Doug and the crew. Below are the Pittwater yachts making taking on the epic 628 Nautical Miles to the finish line in Hobart, as listed on the Rolex Sydney to Hobart Yacht Race website - we're sure there are other Pittwater Sailors among the crews and boats listed, apologise in advance for omission and would welcome the opportunity to add you in for the record - please email us with details. Everyone here in Pittwater will be cheering all of you along, whether skippering a maxi or one of the many other types of yachts making their way south - have a safe passage and an excellent race. A Hobart novice, this is the former Kokomo, then owned by development tycoon, Lang Walker, who campaigned at major Farr 40 one-design events in Australia and overseas with his fair share of success. Andrew and Amber Butler previously owned a Dufour 36e before making the step up to this Farr 40 they renamed Komodo to raise awareness of the endangered Komodo dragon. Together, they made their debut in the 2015 Land Rover Sydney Gold Coast Yacht Race and finished 47th overall, keeping company with the likes of Wild Rose through tricky conditions on Days 1 and 2. The iQGroup and Team Komodo Racing have partnered for the 2015 Rolex Sydney Hobart. The boat is distinguishable by the Komodo dragon on its main with an iQ over its head and a huge iQ on the headsail. *The Komodo Dragon is listed as endangered by National Geographic and the WWF. A decline in egg-laying females combined with poaching and human encroachment has seen the future of this powerful reptile put at risk. Local Hero finished the 2014 Rolex Sydney Hobart in 54th overall under the guidance of skipper Matt Bassett, deputy for Peter Mosely who no longer enjoys long ocean races. Previously, the BH36 sailed to Hobart in 2012 and was PHS fourth overall, and in 2010 placed 20th overall and third in IRC Division 4. This team is energised after finishing 11th overall and fourth in Division 3 in the 2015 Land Rover Sydney Gold Coast Yacht Race. Local Hero has made a name for herself at Hamilton Island Race Week. She won IRC Division 3 and was named ‘Yacht of the Regatta’ in 2014, and this year, gun Canberra sailor, Matt Owen, skippered her to a Division 4 win of the IRC Australian Championship. This was Dr Hugh Torode’s yacht, variously known as Pelagic Magic and Shepherd Centre, and last raced to Hobart in 2013, finishing 41st overall and fourth in Division 4. In the 2010 race, it finished 33rd overall and fourth in IRC Division 4 and third in ORCi Division 3. In the 2011 Hobart, was scored DNF due to a failure to report at Green Cape, which is mandatory. New owner Simon Dunlop has entered the race with an experienced crew from Melbourne, Batemans Bay and Canberra, where 26 Hobart race veteran, Erik Adriaanse, resides. In her maiden Sydney Hobart last year, James Whittle sailed Takani to 12th under PHS and eighth in Division 2. The boat is a luxurious Hanse 495 from Pittwater, which came into Debbie and Jim Whittle’s lives in August 2012. They named her after their children; Taylah, Kasey and Nicholas. It was celebrations all-round last year, as Taylah, their 19-year-old daughter, contested her first Hobart and Jim celebrated his 50th Birthday on Boxing Day, the same day as the Hobart start. Enjoyed a leisurely warm up at Hamilton Island Race Week to finish 15th in Cruising Division 1. Veteran yachtsman, Bill Ratcliff, joins the crew with 46 Hobarts to his credit. Ugg Australia is a classic S&S Swan 65 and the 35th of 40 yachts built by Nautor in the1970s and early 1980's. A Swan 65 won the first Whitbread Round the World Race (now the VOR) and, given the right conditions, Ugg could come into her own. Originally launched in 1981 as UK registered ‘Cheetah of Hamble, and then as Italian registered ‘Kenta’ from 2000, this Rolex Sydney Hobart greenhorn has just been imported to Australia and will take up residence in Sydney as Eve. She will have the company of another Swan 65 in the race, King’s Legend, which is six years Ugg’s senior. The abnormally light airs of Bass Strait in 2014 provided Wild Oats XI with her getaway from the brand new Comanche and she sailed to a record making eighth line honours victory, outstripping Kurrewa IV/Morna’s seven, held since 1960. On taking line honours in July’s 2225nm Transpac Race from Los Angeles to Honolulu, and hearing both Comanche and the new Rambler 88 were coming to town for the 2015 Rolex Sydney Hobart, Bob Oatley made the drastic decision to make major modifications to his yacht to keep her competitive. A 10-metre section was cut off the bow and a new longer bow section attached. Two metres was cut off the stern and changes were made to the hull configuration, sail plan and rig. The project at McConaghy boats (which built the original yacht) took three months. Come what may in Rolex Sydney Hobart, which will be her most significant ever, Bob Oatley, his skipper Mark Richards and crew can be proud of their achievements to-date, including twice taking the triple crown of line honours, race record and overall winning the race in 2005 and 2012. Her record time to beat is 1day 18hrs, 23mins 12secs. She has only been bested twice for Hobart line honours since her launch – by Alfa Romeo in 2009 and Investec Loyal in 2011. Wild Oats also holds the Sydney Gold Coast Open race record (22hrs 3mins 46secs set in 2012), the Cabbage Tree Island record (12h 15m 55s set in 2012) and Port Hacking Bird Islet Race (10h 51m 41s set in 2013). Crew member Steve Jarvin lines up for a hopeful 14th Hobart line honours victory (his 13 are unprecedented).